Every album tells its own unique story in its own special way, just like a book. As well, music connects us to ourselves and to one another on an emotional body level like nothing else can. If we are listening, if we are feeling, everything speaks. Mystic’s Nine was several years in the making. In 2010, having finished the 12 CD series of music & meditation for vibrational attunement of mind, body, and spirit, & the creation of several other spiritual tools focused on helping humanity move forth in these challenging times, my thoughts and feelings were then guided in the direction of breaking out of that particular parameter; a reclaiming of my musical self, or perhaps all of my “selves” that had been previously focused elsewhere. I am a classically trained pianist (and violinist) & longed to connect more freely in this regard with the music that resides in my soul. So with excitement I began the new journey. But, Spirit has its own ideas about timing, & it was not to be. In 2012 my husband had his first stroke. And more. Over the course of the next 4 years, life as we knew it was forever & irrevocably altered in every way. But through it all, we learned, grew, loved even more & completed with grace our earthly life together. The human body & spirit are way more resiliant than we may even realize. Our capacity for love is utterly boundless. And in every moment we have a choice to bring joy and laughter into our lives no matter what the situation. All songs written by DYAN GARRIS except as noted below. Dyan Garris, keyboard performance on all songs. JOE BAUER, drum performance on Mystic’s 9, Cloud 9, East on 9th. PETER STERLING, harp performance on Muse’s Gift & Aquamarine. Fractal art, courtesy of Sven Geier. Graphic art & design, Dyan Garris. © 2016 Dyan Garris, Journeymakers, Inc. All Rights Reserved. Definitive of melodic new age music with influences of both 80’s and 90’s-era works in the genre, there is just enough musical variety on here to keep things interesting. An angelic essence infused with a genuine spirit of love and joy radiates throughout this album, one that is sure to leave the listener with a feeling of both deep peace and solace! Want something to brighten up your day and get you off to a flying start? Then you need to go no further than listen to Mystic’s Nine by Dyan Garris. From the very opening foray, the musician will have you hooked with the up-tempo nature of the first piece which is also the title track; there is a delicious vibrancy about this composition that you will utterly adore. The natural sounds that connect us are simply delightful on the piece Mystic Sea, it floats with a majestic quality all around us, and here on this composition one can literally feel the pure energy of love caressing you in what is a powerful, yet pleasing arrangement. The positivity behind this album is obvious, but now let your very senses take more, within this song by Dyan called Muse’s Gift. So allow your troubles to drift away, and just bathe in this moment of harmonic bliss. From the gentle nature of the last offering we now come across a far more rhythmic and pulsating piece simply called Mystical. It’s as if the horn is calling us to a gathering, perhaps of mystics from many dimensions? Musically this track has a wonderful syncopation and tempo, one that creates a lush sense of movement. I hope dear reader you’re enjoying this latest journey through the realms of Dyan Garris and her album Mystic’s Nine. We now approach the half-way point of the release and find an interesting composition called Mystic Kiss, you have also arrived at my personal favourite off the collection as well. What a beautiful composition this is, the chimes are warm and create a friendly atmosphere, while the keyboards manifest such an ambient soundscape, one could get lost in here for hours. On Heaven’s Gate there is a real sense of the angelic realms crafted into this divine offering, this is classic new age music that will pull you back in time to symphonic greats like Mike Rowland, and even perhaps a little 2002 can be found in here as well. The cleverness in creating an album is to know when to change speed and tempo and still carry the listeners with you along the journey, on Cloud 9 Dyan Garris does just that, and even though the pace of the composition is vastly different from the last track, she still maintains a creative warm sense of peace, in an arrangement that will literally have you floating on Cloud 9. The vocal talents of the artist are used once more in the song The Mist. There are times when we all find ourselves within the mist of confusion, but here Garris offers us a piece of music containing a message of determination. As a singer myself, I can share with you that her vocal range, especially on this song, is very impressive indeed. OK, now time to head off East on 9th and once more through the medium of music we are on our way again. The percussion on this track is perfect and whist giving us a feeling of movement, it doesn’t over power the keyboards crafting narrative and structure, this also happens to be one of my other favourites, the chords and construction seem to evolve a wonderful reality of a journey that must be taken. Now we’re here, let’s ease back as we arrive at the penultimate song from the album called Aquamarine. This used to be one of my favourite crystals back in the day, and here we have a really light and almost childlike offering of a composition. It’s simple, but honest style would make this arrangement a perfect tune to play during meditation or relaxation sessions. So as we arrive at the very last port of called for us on our musical sojourn with Dyan Garris dear reader, we are gifted one more track to enjoy called Water for the Soul, and what a charming way to leave the album indeed. Here Garris leaves us with a short form piece that creates its own ambience along the way, and leaving us, the chilled listener, with a real sense of a warm calmness from a musical journey most happily and willingly travelled. Mystic’s Nine as an album will take you back to the classic era of superb and well-crafted New Age music; it’s a release that will be guaranteed to get your day off to a good start. Lovingly produced and performed, Mystic’s Nine is one of those albums every household should have, Dyan Garris should be proud of this manifestation of positivity and sensitivity, it’s a mix really hard to achieve, but done so very admirably by the artist. 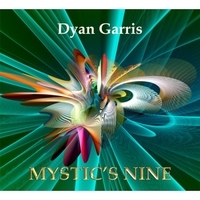 "Mystic's Nine" by Dyan Garris is a wonderful album! There are many different colors and textures of music included on the CD. From the confident polyphony of the flugelhorn on "Mystical" to the arpeggiated chimes on "Mystic Kiss" to the peaceful and euphoric blend of the keyboard and strings on "Heaven's Gate." The more percussive or up tempo tracks, such as "Cloud 9" and the album's opener, "Mystic's 9", are a nice contrast of style. I love the modal and jazz feel of "East on 9th." The hymn-like quality of "The Mist" is gorgeous. The lyrics in this track are powerful yet have a vulnerability too. Beautiful! The harp accompanied by the synth pads on "Aquamarine" is glorious! "Water for the Soul" is a refreshing close to a serene listening experience and an invitation to go forth in peace. I look forward to discovering and hearing more music by Dyan Garris! After a crazy week, I had the pleasure of listening to "Mystic's Nine" for the first time this morning. It is absolutely wonderful! I love the different colors and textures Dyan Garris included on the album. From the confident polyphony of the gorgeous flugelhorn on "Mystical" to the arpeggiated chimes on "Mystic Kiss" to the peaceful and euphoric blend of the keyboard and strings on "Heaven's Gate." The more percussive or up tempo tracks, such as "Cloud 9" (and "Mystic's 9" as the album's opener) are a nice contrast of style. The modal and jazz feel of "East on 9th" is very nice! I love the hymn-like quality of "The Mist." The lyric is powerful yet has a vulnerability too. Beautiful! The harp accompanied by the synth pads on "Aquamarine" is glorious! "Water for the Soul" is a refreshing close to a serene listening experience and an invitation to go forth in peace. I look forward to discovering and hearing more music from Dyan Garris! "Mystic’s Nine" is composer/pianist/keyboardist Dyan Garris’ thirteenth album and was composed and recorded over a period of four years. With a very impressive group of contributing artists, Garris has created a collection of eleven tracks that pertain to the mystical number nine. It is also a concept album “with the theme of the resilience of the indomitable human spirit and triumph over adversity.” Nine of the pieces are instrumentals and two are vocals. Some of this music is ambient and ethereal while other pieces are much more upbeat, melodic and vibrant. It’s a colorful mix that works well in the background as well as with focused listening; I especially enjoyed listening the album while driving down the coast in the rain! Garris is a classically-trained pianist and violinist, but she is also a visionary mystic, voice recognition psychic, and trance channel medium who reads from the Akashic Records. "Mystic’s Nine" opens with the rhythmic and very lively title track. Keyboards, wordless vocals, and driving percussion (Joe Bauer) send the spirit of the album joyfully soaring from the very first note! “Mystic Sea” begins with the sound of flowing water (which is audible throughout) and then becomes a blissfully ambient, gently floating dream that features Scott Schaefer on flute. “Muse’s Gift” is one of the two vocals and features Amber Norgaard (the lyrics are in the liner notes of the CD) and Peter Sterling on harp. “Mystical” cranks up the rhythm behind Jeff Oster’s peaceful flugelhorn and trumpet (Oster co-wrote this piece with Garris) - a favorite. Joe Bauer returns on “Cloud 9” with a pulsating rhythm that propels the piece - another favorite. “The Mist” is the second vocal piece, this time with Amber Norgaard and Margo Joy, and cello by Michael G. Ronstadt. Heartfelt and bittersweet, it’s a beauty! My favorite piece on the album is “East on 9th.” Resonating with a strong beat, a cinematic sweep, and a slightly exotic flavor, this one had me hitting the “replay” button several times! “Water For the Soul” quiets down a bit in a more classic new age mode that is warm, open and free- form, bringing the album to a peaceful close. Dyan Garris is a fascinating artist who brings a wide range of influences to her music. Overall, "Mystic’s Nine" is much livelier than most albums in the “new age” genre, and it’s a sound that I really like. Recommended!